On the hunt to find the very best upholstery cleaner? Unless you can physically take the covers off of your furniture, the likelihood that it’ll ever get properly cleaned is minimal. Even if you could take the covers off, there’s no point paying to take them to the dry cleaners when there’s only a mark here and there that needs lifting. 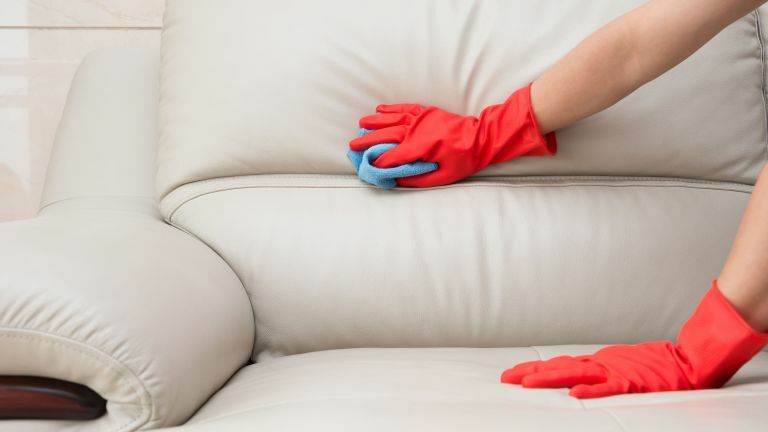 With that the case, spot cleaning has become an ever popular way to keep furniture clean, so we’ve put together this list of upholstery cleaners to help you choose the right one. Once you're done, check out our cleaning sourcebook for the 50 best cleaning product essentials for your home, or see all our cleaning buys, how-tos and hacks to keep your home sparkling on our dedicated hub page. In our opinion, we think the best upholstery cleaner you can buy is the Hoover Platinum Collection Carpet & Upholstery Detergent, it removes tough stains with ease, from carpets, rugs, furniture and more. However, if you're looking for a high-street find or a quick-fix, opt for the Astonish Fabric Stain Remover – you won't be disappointed. Whether your upholstery is traditional or modern, you’ll need a good upholstery cleaner to help you keep your furnishings fresh and hygienic. While your favourite armchair may look clean from a distance, over time, dirt can become embedded in the fibres, so a good upholstery cleaner will work its way deep into the fabric to give it a complete refresh. Leather upholstery, too, can be easily become discoloured or marked over time, so using the right upholstery cleaner is essential to bringing it back to its former glory. Before you use any upholstery cleaner, you’ll need to make sure you read the label (or the paperwork) that came with your furniture so you can ensure that you’re using the right one – some furniture will require a water-based cleaner, while others require water-free products and others may advise against using upholstery cleaner altogether. In our list of the best upholstery cleaners, we’ve provided you with a combination of shampoos, sprays and aerosols so you can choose the best method for you. Before you buy, make sure you double check the ingredients, and test it out on a hidden part of your furniture first to make sure that there are no adverse effects. When looking for the best upholstery cleaner, Amazon is a good place to start, as you can often get bigger bottles at a more cost-effective price. They’re also incredibly accessible for those who prefer not to head to the supermarket shelves, or need an upholstery cleaner pronto! Hoover promises that this upholstery detergent can tackle the likes of grass stains, blood, vomit and the implications of unavoidable accidents from pets and children. Professional strength, it’s a tough one, so you’ll need to make sure that your fabric can handle it before you use it by reading the label and making sure to test in a hidden area first. Hoover recommend that you use this upholstery detergent alongside its spot cleaner, so it could be a fairly big investment if you haven’t already bought the device. Hoover, and existing users, certainly make it out to be a worthwhile investment, though, which is why it's our top pick of the very best upholstery cleaner you can buy. Although initially meant to be used on clothes to remove unwanted stains, this fabric stain remover by Astonish works wonders on cleaning upholstery such as curtains, carpets, fabric sofas and rugs. To use, soak up any moisture from the stain and then spray the product immediately, ensuring you cover the entire stain. Leave for 10 minutes and wipe with a damp cloth or if possible pop in your washing machine – it's as simple as that. We've seen it remove red wine from white carpet without leaving a trace; a cleaning cupboard staple, we think. If you’re willing to sacrifice cost-effectiveness for convenience, then you can’t really go wrong with this upholstery cleaner. For use on fabrics that require a foam or water-based cleaner, you only need to squirt a little bit on and use the brush to dislodge the dirt before blotting away with a damp cloth – easy peasy if you don’t have the time to extensively clean your furniture. Small in size, it’s not the most cost-effective, but should fare well as an essential go-to in the event of an accident or an inexplicable mark appearing. While some embedded stains require a tough cleaner to dissolve them, newer stains, such as a spillage or a pet accident should be easy to remove with this carpet/upholstery spray. It’s incredibly easy to use – just spray and blot – and it can be bought in any supermarket. It doesn’t require a cleaning device, or diluting, making it the ideal go-to for those who don’t have the time to mess around with excessive cleaning. If you're forever trying to get rid of tough pet stains in your home, then this is the best upholstery cleaner for you. While marketed as a car cleaner, this carpet and upholstery cleaner is actually okay to use on the likes of vinyl, velour, cloth, carpet and even sheepskin, thanks to its pH balanced formula – although make sure you check the label of bottle before use, and use in a hidden area first. Okay to use in the car and at home, this is a fairly good all-rounder, although not as strong as others, which means tough stains take a while to come out. Muddy shoes, grubby hands, leaking shopping bags - it’s no wonder your car interior seriously discolours over the years. Whether you’re looking to give your car a spring clean or want to make sure its in pristine condition to sell, this product from Armor should help you to bring your car interior back to its former glory; from seats, mats and even your steering wheel (as long as it’s not leather), it should remove marks and stains without fading the material or leaving it dry. Finding a good upholstery cleaner that is also kind to the environment can be a tough task, but this Earth Friendly Products Lemon Stain and Odour Remover is cruelty free, vegan and carbon neutral. Made from a natural formula of enzymes and plant ingredients, the product cuts through grease, stains and odours on everything from laundry to bins, fridges and even carpets. The best part? No rinsing is required, you just spray, lightly rub and wipe clean. An invaluable product to every eco-conscious home, this is our top pick of the best eco-friendly upholstery cleaner.